For 27 years my mother was a newsagent in the town where we lived. Every day after the end of school, I’d wait in the back office watching the comings and goings until Mum shut the shop and we could go home. I listened in on the moans and groans of the town as the last customers of the day paid for their magazines and newspapers. It was busy, noisy and I loved being a part of it. When my parents announced they were not only keen but going to sell the business, I felt an impending sense of loss. I was to be denied access to what I saw as my second home. They hadn’t consulted me about what I wanted. I was left to pick up the pieces. In my own (almost certainly self-indulgent) way, I mourned the sale of it. I denied the necessary post-sale handover of keys and convinced myself that the shop’s new owners were brusque and unfeeling as they moved into the space which hitherto had been mine. I was thinking about my Mum’s newsagents in the final weeks BBC staff were moving out of Television Centre last year. I was prepared for it for this time. 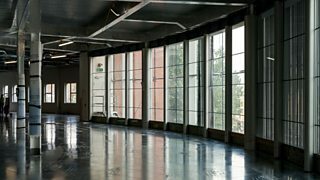 I was thorough: I set about ‘saying goodbye’ to the building, using any spare hour I had available to stroll around the site. I shot some video along the way too. The repeat visits around the newsroom, ‘Doughnut’, Drama building and East Tower reminded me of just how big the Television Centre site really was. I must have lost half a stone in the weeks I’d wandered around there getting footage and saying goodbye. Painful though that goodbye seemed, the site’s sheer scale made it also appear anachronistic and unsustainable in comparison to my day to day working experience. That insight alone suddenly made the goodbyes seem a whole lot easier. Mike explains this in one of the studios currently used for storage of the last remaining TVC items to be auctioned. Row upon row of servers, PCs and other IT equipment - itself an unhappy reminder of my own IT support career past - illustrates Mike’s point: I’ve never seen quite so much IT equipment all in one room before. Television Centre was a considerable site with an equally large footprint both geographically and technologically. It was its own ecosystem. As technology gets smaller, so the need for space decreases and the cost of maintaining it increases. With total savings achieved by BBC’s sale of TVC estimated at more than £600m (the sale alone raised £200m and occupancy costs of at least £30m per annum are being saved from 2015 onwards), the sale of the site has an entirely different context. 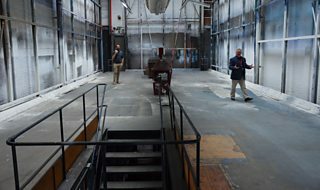 I’ve charged Mike with giving us a tour of the building one last time ahead of Open House last weekend - four hundred tickets were sold “just like that,” says Mike as he snaps his fingers. We spend time in the Doughnut where he points to the Studios 1, 2 and 3 the former and future home of BBC Studios and Post Production, the BBC’s commercial studios, post production and digital media services company. Here demolition and infrastructure works have started - early building work is due to begin next year, ahead of the company’s return in 2017. There’s a sense of excitement in Mike’s voice. This is almost certainly his style of delivery combined with his well-practised patter. But that excitement is infectious. Being back on-site after eighteen months with familiar sights still functioning- like the automatic swing doors at reception and the familiar whirring sound whenever they’re activated –stir happy memories and a longing for the past in the way I thought it might. However, a protective spirit stirs, as though we’re looking at a distant relative recovering from rather aggressive treatment. TVC seems vulnerable to me. I’m eager to see its full ‘recovery’. Not only that, I’m also reminded once again of its immense scale in comparison with the significantly smaller space I’ve now become accustomed to working at Broadcasting House in central London. Stripped of its industry, equipment and people, Television Centre's size is even more striking. 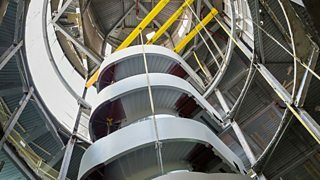 That excitement for the refurbishment to be completed as quickly as possible is fuelled no doubt by Stanhope’s fly-through video and master-plans detailing how the site should look after work is completed. 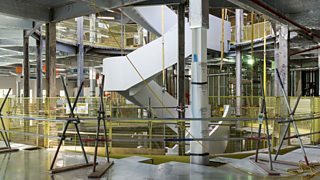 So too, the progress photography on the refurbished offices for BBC Worldwide’s HQ – a milestone in the development of the building and a suitable home with an iconic backdrop for a business selling the BBC’s brand to the world. I’m surprised (and perhaps a little relieved) at myself about how eager I am for other people to benefit from the site – those who’ll stay in the 40 room hotel, move into the 950 new residences created or just walk through the eventual public spaces. It appears I have found a way of moving away from home. He’s right. During my wandering around TVC in March 2013, there were some doors in the Drama Building which were disappointingly locked, mysterious spaces behind doors I couldn’t open. Up a narrow set of stairs and through an equally narrow (now unlocked) door and we’re inside a high roofed room, standing on a suspended floor with a flight of stairs disappearing away from us. It feels like a stage. It could easily be the TARDIS set I wanted my Dad to build me as a kid (but he didn’t because the local wood store ‘apparently’ didn’t have enough material available). Here was my own special TV set where I could for a moment or two, in my head at least, play out my own imaginary TV drama. Mike explains that this is the scenery dock. The paint on the wall is from a time when scenery painters created backdrops for various TV programmes. “When they’d finished painting one part of the backdrop and needed to get a bit higher up, they’d use this lever here.” Powered up, there’s a sudden whirr and the frames hanging at either side start moving up and down. If the TARDIS really was real, this would be it. And I was in it. The sense of sadness didn’t kick in here either. Instead I stand there trying to work out when we last made painted backdrops for sets? Wasn’t that years ago? And why did we stop making them? Something to do with TV dramas largely being made on location, technology making it possible for realistic locations to be used in TV production. Suddenly the impact of technological advances on ‘traditional’ crafts – the greater sensitivity of cameras, freeing directors from the constraints of a controlled studio environment and the need for sets, for example – is plain to see. The scenery dock is no longer a destination for nostalgia lovers, but a place where the impact of technological advances on traditional crafts is apparent . And how such advances suddenly make such locations anachronistic. More than any other location on the Television Centre site, this feels like a real goodbye. Timely. Necessary. Healthy. The fourth floor in Television Centre. Eager to test out my transformed thinking, I ask Mike if we can squeeze in one extra destination. On the way to theold BBC club– now missing all of the familiar furniture, covered in builders dust and the balcony sporting weeds that have grown in between the patio slabs – we stop off at Room 4099, the one office I worked in whilst I was based at Television Centre. Bottles labelled “Fake Tan” have been left on the shelf from the time Strictly Come Dancing had offices here in Entertainment Production. My time goes back to Any Dream Will Do, and the night of Eurovision pre-selection when Andy Abraham was selected to represent the country. Standing in the office now remembering those memories, I’m reminded how distant this office was from proceedings we were covering online during the live broadcast four floors below. How the distance seems unfathomable now in comparison to proximity of studios and programme making in nearly every other BBC building I’ve been in since. Scale has reduced dramatically. Things can be done in less space in closer proximity to production space. It takes returning to a former home to realise just how much things have changed and how much they needed to change too. Our visit has gone on longer than I realise. My colleague looks at his phone saying he is already ten minutes late for his 11 o’clock. 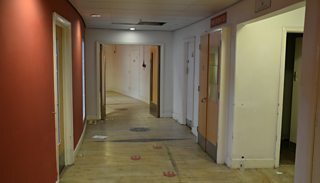 We walk at speed along the 4th floor corridor in search of a working lift (there are only one or two in the building ‘switched on’ now) and head for the audience foyer – now a canteen and office for the builders working onsite. The buzz remains in this part of the building just as it was shortly before it was finally vacated. It’s the sound of the buzz that casts me back. Memories stir. A dangerous moment. I grab my bag and coat from the office and make for the barriers. 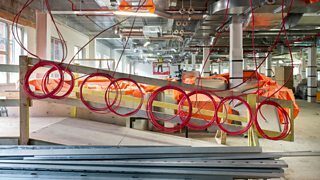 Read Facilities Manager Mike Eaton's blog detailing progress on the Television Centre refurbishment published earlier this week. 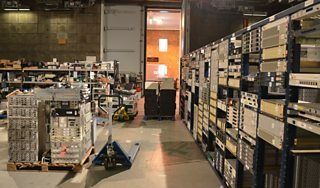 Discover more about the iconic Television Centre on the History of the BBC website.